We offer a choice of panel systems that easily adapt to a variety of applications and allow for fast, easy installation without compromising quality. 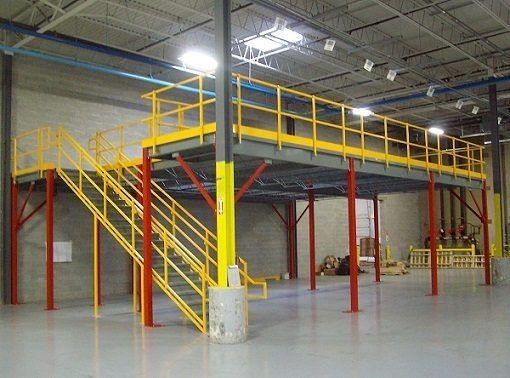 Installing Mezzanines in your warehouse or factory can practically double the space you have by adding a secondary floor above the warehouse floor. Panel Built Guard booths are stronger than traditional because each section is designed to withstand the stress of transportation and assembly. Panel Built manufactures standard and custom modular buildings including: InPlant Offices, Mezzanines, Security Booths, Interior and Exterior Equipment Enclosures, Wall Partitions, Cleanrooms, Modular Offices, Stair Systems, and Ballistic Buildings. Click here to see our wide variety of products offerings. Are you working on a building project? Let us put together a custom quote specifically tailored for your needs. Click here to see our all products images. Click here to see find a rep.
"PBI was very involved... nice drawings with quote!" The decision to go with Panel Built resulted in a flexible (floor plan) office addition and reduced the loss of floor space to almost nothing; while allowing an expansion that we needed. We needed it done fast, and we needed it done right. We chose Panel Built because we knew they would deliver. We were very comfortable with Panel Built. There was nothing standard about this building, and we needed it quickly. They met our schedule and made sure we were satisfied. Panel Built was able to design a mezzanine structure to fit our needed dimensions. The installation crew was very professional and self-sufficient. I would highly recommend Panel Built for anyone’s office needs. PBI was the GC for our new office in Wyoming. They did a great job on our building in spite of weather and labor shortages. We had many changes during construction and they always made them happen. It was a pleasure working with Panel Built. They were able to construct our operator cabins to meet the strict building codes enacted by the state to withstand category 3 hurricanes.